A chart can be positioned like an image or textframe, either geometrically or as a single character. The new ChartFrame class handles the positioning of the chart in a document. Such a ChartFrame is always associated with a Chart control that handles the appearance and the data of the chart. In order to insert a chart diagram into the document, we need to create a new chart. Make sure that a reference to System.Windows.Forms.DataVisualization.Charting.Chart has been added to your project. Each chart object needs a ChartArea that represents a chart area on the chart image and a Series object that is connected to that area. In a next step, we can load the XML into a DataSet. The column names are used to set the member of the chart data source used to bind the X and Y values of the series. Finally, the first table of the DataSet is specified as the data source for the Chart object. 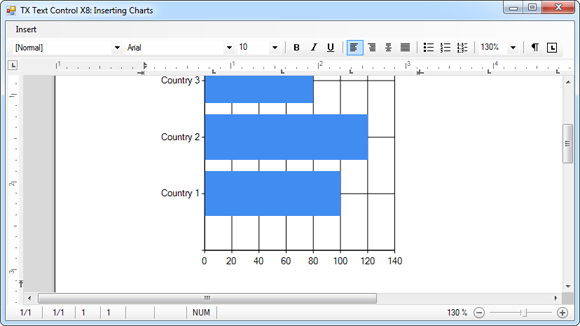 A new ChartFrame is created and inserted into the Charts collection of TX Text Control.